Enjoy some of NYC's finest restaurants after you browse through our New York City dining guide. Find all types of places to eat in NYC, from five-star restaurants to affordable diners. Take advantage of some of the most popular restaurants in the Big Apple after browsing through our comprehensive NYC restaurant guide. 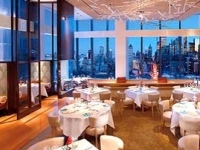 Find all types of restaurants in NYC, sorted by different categories.